I am thinking of fitting said end can to my bike, i know some of you, Rich s1000xr in particular has done it, if the bike will need remapping to suit or will it be ok. This is a cosmetic exercise rather than seeking more power, but i don't want to start burning out valves. If anyone can shed some light on this i would be grateful. If it's just the end can, you won't need to remap. You will if you fit the Akra headers as well though. Thanks Rich, i've ordered it. I was looking online for the titanium akra can, and it only seems to be BMW motorrad that sell that specific model (at around £600). Several other websites sell the black can but that typically retails at around £800. Does anyone know if the titanium can is exclusively sold by BMW, or will I find any better offers with different retailers/ websites? 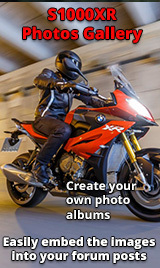 I scouted around the internet and found the cheapest ( £ 581.00) was from BMW Motorrad in Germany. It is grey not black, but having a silver bike it will look ok. After i paid my money they informed me they had no stock and were waiting delivery, great! I am still waiting 3 weeks now but if it's £300 quid less then i am happy. I also ordered a carbon rear longer hugger and chain guard from Powerbronze who were nice to deal with but again no stock but they did tell me first. I decided to order it and get in the queue. Oh i am enjoying this bike! Exhaust arrived from Germany today in it's own polystyrene coffin and looks and sounds the dogs doodah's! Why the vast difference in cost compared to the UK? I managed to negotiate £599 with my dealer. It's being fitted to the bike ready for collection on Tuesday. Have you left the dB killer/ baffle in? I fitted my exhaust as it came out of the box and it's loud enough for me. As i said i have done it for looks rather than more power. We have a " power valve", cable operated just like an old Yamaha EXUP and i don't want to interfere with that or the mapping. It doesn't feel slower. What is wrong with the stock end can?